In lieu of flowers memorial donations may be made to the Activities Department at Community Springs Healthcare and left at the funeral home. 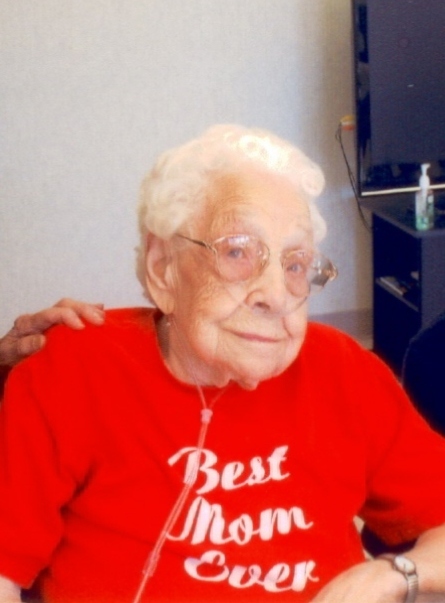 Henrietta Mabel Pray, age 100, of El Dorado Springs, MO, passed away March 29, 2013, at Community Springs Healthcare. She was born in Portales, New Mexico, on November 28, 1912. Her parents died when she was very young. Soon after, she and her siblings were sent to Missouri to live with an uncle. When her older sister was married, Henrietta moved to Nevada, MO, to live with her. Henrietta graduated from Nevada High School. In 1932, Henrietta married A.E. “Gene” Pray. Together they had three children: Shirley, Larry, and Donald. Henrietta was a homemaker, and enjoyed caring for her family. After her children left the nest, she began working at the shoe factory, where she worked for sixteen years. Henrietta was a very active member of the First Christian Church. She was also a 50 year member of the Eastern Star. Henrietta had a variety of interests, including cooking and baking. She was known for her cinnamon rolls, which at one time were sold at the local drug store. Throughout her life, she enjoyed knitting, and used her craft to make beautiful sweaters and afghans for family and friends. Henrietta has been a good wife, mother and friend to many. In her 100 years, she has enjoyed life and lived it to the fullest. Preceding her in death were her parents; her husband, Gene; one son, Donald Pray; and one granddaughter Jennifer Lynn. Henrietta is survived by one daughter, Shirley Lynn of El Dorado Springs; one son, Larry Pray and wife Ellen of Nashville, North Carolina; one daughter-in-law, Carla Pray of Elko, Nevada; six grandchildren; nine great-grandchildren; and other relatives and friends. Funeral services for Henrietta Pray will be held on Thursday, April 4, 2013, at 10:00 a.m. at the El Dorado Springs First Christian Church will Pastor Jack Daniel officiating. Burial will follow in the El Dorado Springs City Cemetery under the direction of Bland-Hackleman Funeral Home.